An artist's illustration of the ExoMars 2016 Schiaparelli lander (right) separating from its Trace Gas Orbiter mothership on Oct. 16, 2016 ahead of a planned Oct. 19 landing. ExoMars 2016 is a joint mission by the European Space Agency and Russia's Roscosmos space agency. A European spacecraft destined to land on Mars detached from its mothership on Sunday (Oct. 16), setting the stage for a daring descent to the Red Planet's surface later this week. The European Space Agency's Mars-bound Schiaparelli module separated from its carrier craft — the Trace Gas Orbiter — at about 10:42 a.m. EDT (1442 GMT) as both spacecraft were in the home stretch of their 308 million-mile trek (496 million kilometers) to Mars. If all goes well, the two probes (which make up the ESA-Russian ExoMars 2016 mission) will arrive at the Red Planet on Wednesday (Oct. 19), with Schiaparelli dropping down to the Martian surface as its mothership enters orbit around Mars. The Wednesday arrival of Schiaparelli and the Trace Gas Orbiter will kick into high gear the first phase of ESA and Russia's ambitious ExoMars project aimed at searching for signs that life ever existed on Mars. A second mission will launch the ExoMars rover and surface science station to Mars in 2020. The Trace Gas Orbiter, or TGO as it's called, is built to seek out water-ice deposits on or just below the Martian surface, according to an ESA mission overview. It will also investigate the presence of methane in Mars' atmosphere to help scientists learn exactly how the gas — which can be created by geological and biological processes — may have formed. 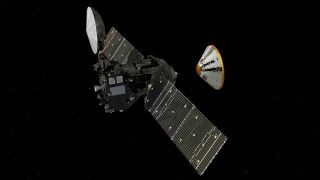 After entering orbit around Mars on Wednesday, TGO will begin a long series of aerobraking maneuvers that should last into 2017, after which its science mission will begin. The lander will use a heat shield, a huge parachute and thrusters to land on Meridiani Planum, a vast region of Mars that is also home to NASA's Opportunity rover. During its six-minute descent, a camera on Schiaparelli will snap up to 15 pictures of the trip down to Mars. The probe also contains set of science instruments to monitor the Martian atmosphere while it is active on the surface. With Schiaparelli and TGO now making their separate approaches to Mars, all eyes are turning to the arrival and landing on Wednesday, Oct. 19. ESA will webcast the arrival of TGO and Schiaparelli online Wednesday beginning with an ESA Social TV webcast at 9 a.m. EDT (1300 GMT). ESA's primary ExoMars arrival program begins at 11:44 a.m. EDT (1544 GMT) and run through about 1 p.m. EDT (1700 GMT). A second part will resume at 2:25 p.m. EDT (1825 GMT) and last just under two hours. ESA officials will also hold a follow up press conference on Thursday (Oct. 20) at 4 a.m. EDT (0800 GMT) to showcase images from the Schiaparelli module's descent camera. You can follow all of the ExoMars 2016 arrival and landing events via the ESA's Livestream page. You can all see the events on Space.com here, courtesy of ESA. Visit Space.com this week for complete coverage of the ExoMars 2016 orbital arrival and landing.